With all the sickness and warm weather, it hasn’t seemed much like Christmas around here. 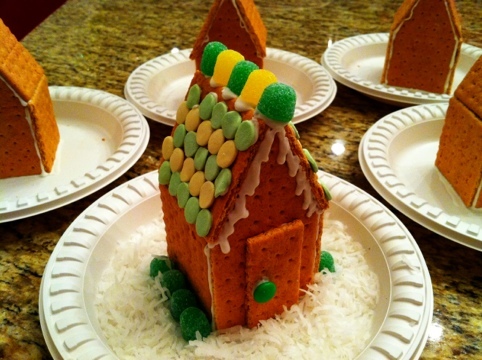 So here is my latest attempt to get into the holiday mood: cookie cottages. And I think my first attempt came out pretty cute! I basically followed Martha’s directions, including making her royal icing, and I think that was helpful with construction. And it wasn’t too hard to make. There are other blank ones in the background, going to try to have JJ and one of his good buddies decorate them tomorrow. After doing one, it is kind of difficult! Certain requires more coordination and patience than a 2 year old might have. So I suspect there maybe more candy consumption rather than cottage decoration, but that’s ok. I think it will be fun and cute! And I have back-up gingerbread men to decorate. Recently, a huge portion of my spare time has been dedicated to my sister’s 40th bday gift. Not that she is hard to shop for, but what do you give a girl who has everything?! Anyway, I had noticed at Christmas that she and her hubs were still using the felt stocking that she and I had made for them about 10 years ago. Then and there I decided I was going to make her a new stocking for her bday. Then I realized I couldn’t just make her one, and not a matching one for her hubs, so 2 stockings to the project list were added. I really love how they came out, and I think Yarbs like them too! and I love the color scheme – Yarbs loves pink, so this was perfect. and her hubs is not afraid of a little pink, either. 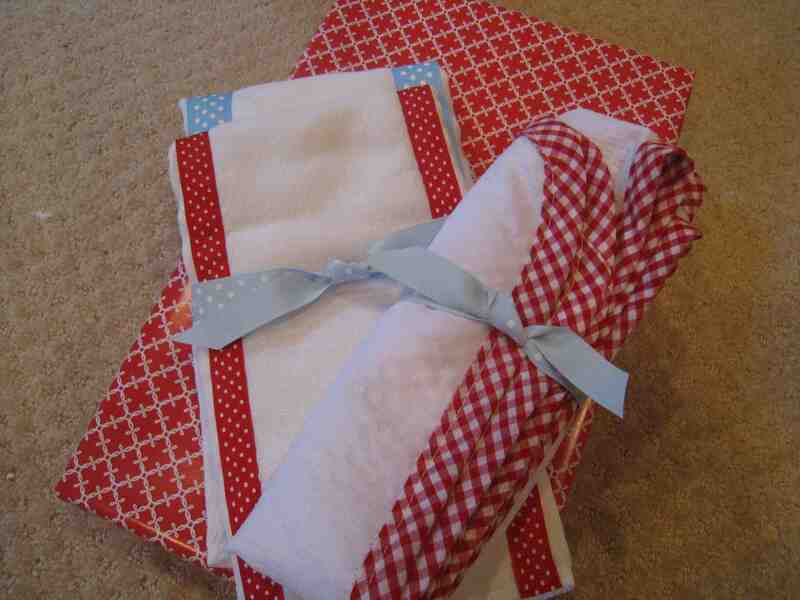 I liked using the bias tape (hand made by moi) on the blanket also on the burpie – really ties it all together! Hope she can get some good use out of it all. And for PoPo, who is still far away, JJ (again) was saying PoPo and pointing to the door! He misses her so much! Here they are – waiting for her to come back! I’ve had the idea to make a “First Birthday” poster for Jack ever since his birthday party – and today I finally did! I used most all of the photos from our photo booth – and actually edited every photo (with the help of Pioneer Woman‘s Photoshop actions). I really like how it turned out! I think it helps that everyone is standing in front of the same backdrop – so even though people are wearing all different colors, all the pictures kind of “go” together because the backdrop colors are the same. It was so fun to look through all the photos again – I remember at the time thinking Baby J was such a big boy, but looking back, he was just a baby! I guess he is still a baby – just a bigger baby than Little Sailor. Can’t wait to get it printed and framed! Brady Gaga update: There is actually not too much to update. As of Monday, I am 1 cm dialated, but that really doesn’t mean too much. BG has until 730am on March 24th to arrive on his / her terms. At that point, the doc will be going in to retrieve him / her! Let’s all hope s/he will be ready to come out before then! Many thanks to Dana for her excellent tutorial! It really wasn’t as hard as I thought it would be. (I also want to try my hand at making basic pants for JJ with this other tutorial of hers.) I seriously don’t know what I would do without all these great tuts out in blogland (probably have a lot more free time – hehehe)! Many thanks! And I have made the edging, cut the back and inside of BG’s monthly picture bunting blanket. The big news is I finally sewed all the actual buntings onto the front of it! Had to iron them all down (since I actually fused them to the front fabric) and then machine applique them on 2 sides. The tops of the buntings will be covered with bias tape that matches the fabric for the name that will go across the top of the blanket. All that will have to wait until BG’s arrives – so everything that I can do I have done for this blanket. Which is good. Last week was great since Boom took Friday off and we got to spend time together for 3 straight days! The only issue with the nice weather is that the parks in the neighborhood get totally packed and chaotic! There are people who drive in (probably takes them 20 minutes!) to use my neighborhood parks. Which is kind of annoying – you’d think they’d just use some parks out where they live. Sigh – oh well. One of my favorite layouts is the photo booth pictures! I love how it looks and really love the photo booth concept! Hopefully at every birthday I can have a different “photo booth” that compliments the theme of the birthday party. Who doesn’t love a photo booth! 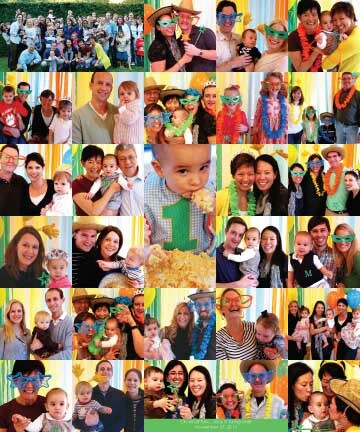 Anyway, I want to use all of the photo booth pics (I could only put a portion of them in the book layout) to make a poster for JJ’s room. Winkflash, although it doesn’t have the best user interface, often has great daily sales (for instance, the other day they were doing a sale on 8×10’s for $0.75, so I bought 23 🙂 and I have seen where they have their 16×20 or 16×24 posters on sale for just a few dollars (not that they will break the bank full price either). Just a couple more things on my craft list of things to do (the poster, and also creating the pregnancy picture prologue)….